Recipe for a perfect Sunday morning: Start with 1 beautiful warm summer day, add a great bargain prix fixe brunch menu, a patio table, free parking and top with wandering around SOWA open market. Gaslight offers their prix fixe brunch menu all day on Saturday and from 10am to 11am on Sundays. It is only $10 and includes juice (orange or grapefruit), coffee or tea, a piece of Julia Child’s shortbread with raspberry jam, and a choice of: Vanilla French Toast, Omelette Lyonnaise or Scrambled Eggs & Cantal Cheese. 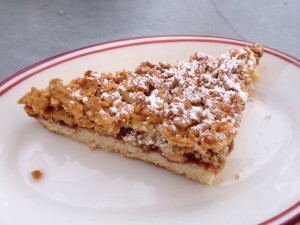 The shortbread was delicious; the base was buttery and tender and the jam crumble was a perfect topping. 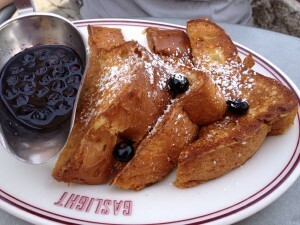 Jes got the French toast – it was 3 generous slices with a blueberry compote. She remarked that the French toast was incredibly light and fluffy. 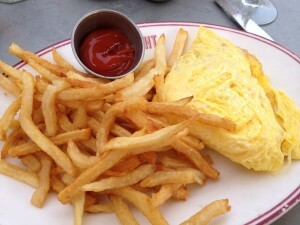 My omelette was filled with Gruyere, diced potatoes and sweet caramelized onions. I think my omelette slightly overcooked (there should be no browning on a proper omelette) but the flavors were good. I was surprised and pleased to see it came with a generous helping of crispy fries (I really love fries). Our server was friendly and we never lacked for a water or coffee refill, despite the patio filling up with the brunch crowd. The regular brunch menu also has a great looking Berkshire pork hache and a Croque Madame, if the prix fixe doesn’t appeal to you. Gaslight is right next to the SOWA open market, so we were able to take advantage of our free parking and enjoyed browsing through all the arts, crafts, jewelry, food and vintage stalls. I couldn’t ask for a better way to spend my morning.